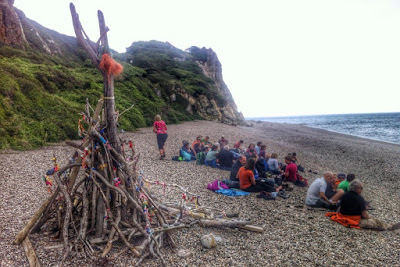 This time last week I was recovering from my exertions on the two day Earthwalking event along the Jurassic Coast from Beer to Sidmouth. 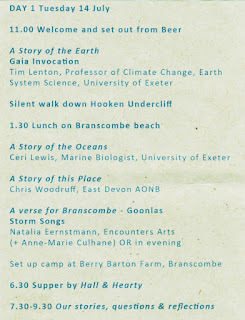 The event was organised by Anne-Marie Culhane with the University of Exeter and was billed as providing an opportunity for exploring earth as a living system through different stories of the sea and land, time and change ... with contributions from artists, scientists and the local community. It did not disappoint. 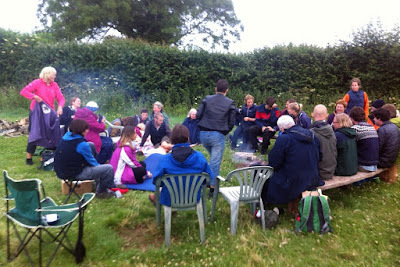 There were 30 of us in total and I must admit that I had some trepidation at the start. Anyone who knows me would say that I am a bit of a cynic and sceptic - especially when it comes to teachers and academic institutions. However, once we had gathered on the beach at Beer to set out on the walk all that disappeared. For a start, in addition to Anne-Marie (whose work I had been aware of and had admired for some time) I found myself in the company of Phil (crabman) Smith - another legend in the world of Art walking. The rest of the group was an interesting mix: A good representation from Exeter University - some of whom also provided instructive talks at intervals; people from the performing arts; some with theological experience; and others from a variety of backgrounds. Over the two days there was opportunity to talk and exchange views with some - but inevitably with a group of 30 on the move, in-depth discussions were limited. 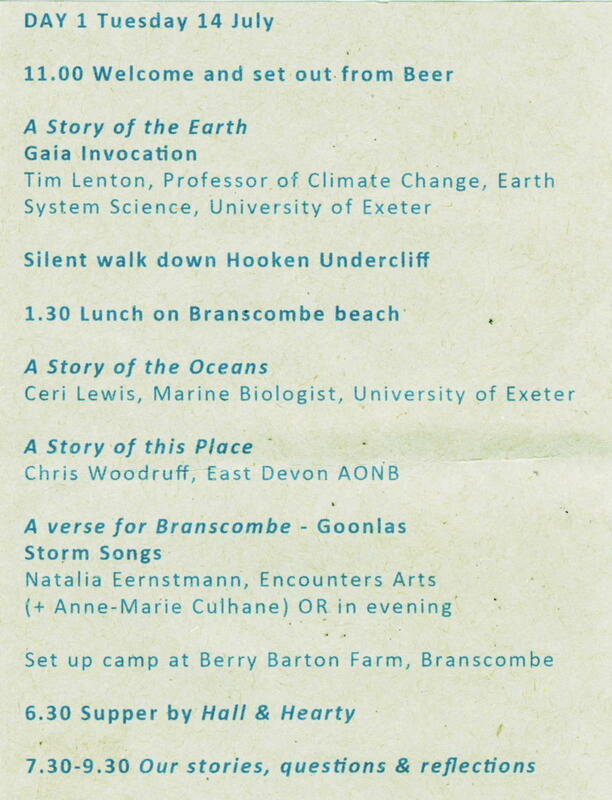 There were many highlights: Tim Lenton's clever personification of the earth in a monologue setting its history in the context of a human lifespan; Ceri Lewis's explanation of how the oceans are being polluted and the implications for all of us, complete with Blue Peter-style experiments and specimens plucked from the sea; the walk down the Hooken undercliff; and Tom Powell's history of the Weston Plats and thoughts about why so many people take comfort from their gardens. The overnight camp proved to be the greatest highlight. Contrary to expectations the veggie food was terrific and the weather improved enough to allow us to spend the evening around the camp fire, exchanging stories using a talking stick (stone), listening to Goonlas (sea) storm songs, and dancing to some traditional folk tunes. Unfortunately, I didn't complete the first day without injury and had to retire to my toytown tent as the talking went on into the night. 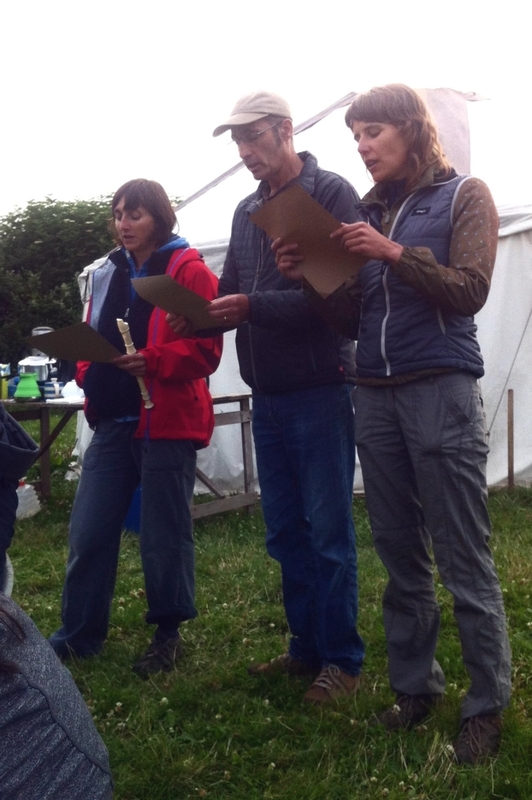 When considering whether I could do the walk I had taken comfort from the fact that we were only doing 5 miles a day. This is not much greater than a walk to Teignmouth and back from my home - which I have done occasionally without requiring the emergency services. However, I didn't take into account the amount of trekking up and down the cliff face. This, combined with a stupid failure to lace up my walking shoes tightly enough, led to my feet being bloodied and blistered at the end of day one. Day two started with field sensing - Something which I didn't try as it required bare feet and I had just spent 45 minutes binding up my injuries. We then walked the cliff top and continued with a fascinating visit to the Weston Plats - formerly small fields used as market gardens by local people, taking advantage of the area's mild micro climate to grow early crops and supplement their incomes. In the afternoon the group did the last trek into Sidmouth but I opted out of this - the steepest part of the walk - as I was hobbling by now. The final event of the day was a meeting in the Dissenters Meeting House in Sidmouth where we heard from the Sidmouth Vision Group about how they are working with the community to address eco-issues. Overall it was a great experience. I remain a camping sceptic but the scenery, which I have not tried to describe (but hopefully you can get a taste of from the photos - fuller set here), and the opportunity to learn and discuss with people from a variety of backgrounds was terrific, and will be memorable for some time. 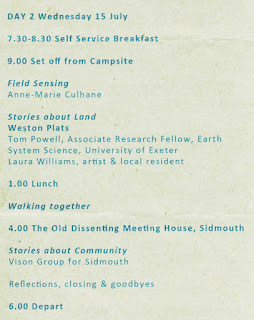 Many thanks to Anne-Marie for organising this and to Kate Paxman at Smooth Space where I had the opportunity to hear both Anne-Marie and Phil Smith speak earlier in the year. Anne-Marie Culhane's blog post about the experience can be accessed here.